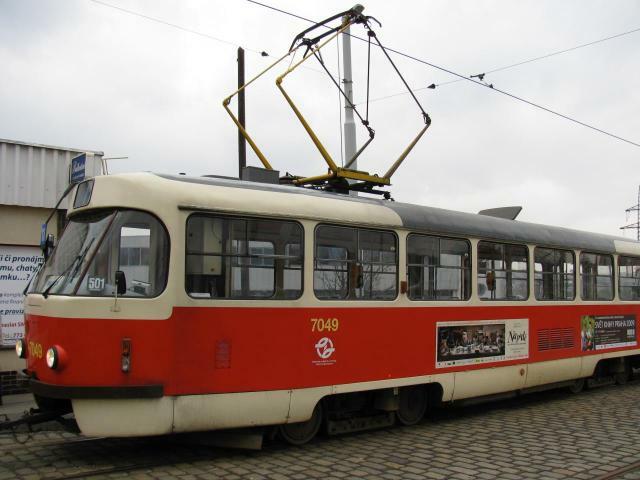 Prague has an integrated regional transportation system. There is an extensive system of trams (streetcars), a Metro (subway/underground) with three lines and numerous bus lines to fill in the gaps. Your ticket is good on all these forms of transportation. You must purchase a ticket before you board a tram, Metro, or bus. Tickets can be bought from machines at Metro stations and at most convenience stores. Your hotel may also sell tickets. When you board the bus or tram, or enter the Metro station you must validate your ticket. There will be yellow boxes with a slot -- you place the ticket in the slot and it will be stamped with the time and date (and the ID of the machine validating). 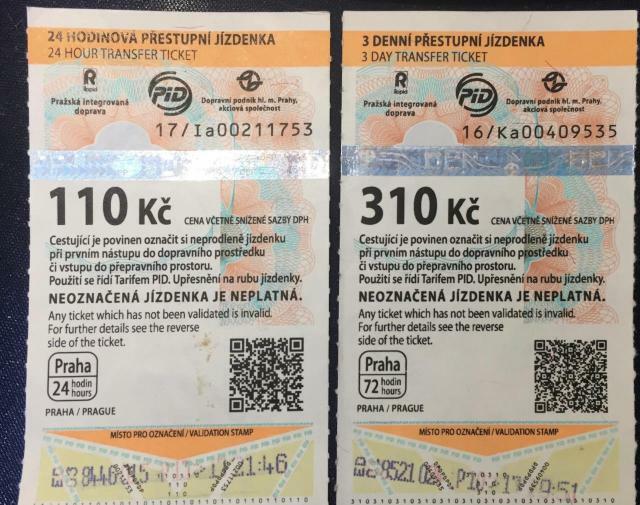 Single journey tickets come in two types: A short trip ticket (good for 30 minutes) for 24 Kč (about US$1 at the time of writing) and a regular ticket (good for 90 minutes) for 32 Kč (about $1.35). It is valid on all forms of transportation: you can take a bus, tram and Metro all on the same ticket, so long as you complete the journey in the allotted time. You can even make stopovers but it is supposed to be a one way journey. You can also buy passes, one valid for 24 hours for 110 Kč (US$4.65) or 72 hours for 310 Kč (US$13.20). Often called "1 Day Pass" and "3 Day Pass" they are actually valid for 24 (or 72) hours after they are first stamped. So a 24 hour pass stamped at noon will be valid until noon the following day. Longer term passes (monthly, quarterly, annual) are available but they require you to fill out an application and submit a photograph. Inquire at any ticket office or tourist information office. The Prague transportation authority - DPP - has a very good website (in English) at http://www.dpp.cz/en/ You can plan your trip and get information about service and schedule changes. They also have a very good free mobile app available for both Android and IOS. You can search in your App store or get links here. I don't believe they are currently offering real-time tracking with the app (or website) -- the times you see are the scheduled times so you should allow some leeway in your planning. In some cases tram stops may be on islands in the street but in many cases you wait on the sidewalk until the tram stops and walk into the street to board. All tram and bus stops are marked with signs like the one above. It will list the lines that stop there along with a listing of the stops for each line. The app or website journey planner will give you the end station of the tram, bus, or Metro and you can check it agains the route listed to make sure you are traveling in the proper direction. Unfortunately, the Metro does not reach Prague aiport (PRG). You have to take a bus and then transfer to the Metro (or a tram). The good news is regular fares apply so a 32 Kč ticket is valid, along with the 24 hour and 72 hour passes. There are two different buses you can take, depending on which Metro line you want to connect with. 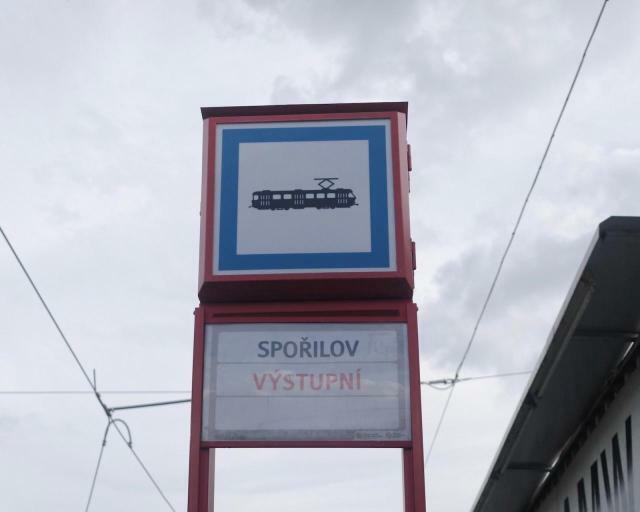 Bus 119 takes you to Nádraží Veleslavín where you can catch Metro line A (or tram 26 for a more sedate but scenic trip). The bus usually runs every 10 minutes or so (5am to midnight) , though on weekends and late evenings the interval can be as great as 20 minutes. It is about 20 minutes from the airport to Nádraží Veleslavín. Bus 100 takes you to Zličín where you can catch Metro line B. The bus typically runs every 15 minutes and takes about 15 minutes for the trip. There are many car services that will take you between your hotel and the airport. Check with your hotel and they most likely can arrange one. The transit information is this article and on the website and app is for daytime operations, which is roughly from 5am to midnight. There are night bus and night trams that run between midnight and 5am. The night bus lines are numbers 900 and above and the night tram lines are 90-99. In addition, the ride hailing service/App Uber does operate in Prague. The lower cost service -- equivalent to UberX in the US -- is called UberPop. Taxis also operate in Prague but there are many scam/unlicensed operators. It is best not to hail a taxi on the street, unless at an official "Fair Place" taxi stand. Having your hotel call and order a taxi is best.